Hey Natstown, Screech here. I hope you’re all just as excited as I am that baseball is back in the Nation’s capital! It’s seemed like forever since Justin Maxwell beat the Mets on a walk off grand slam that ended 2009’s home games. This year I’m really excited about our chances to succeed with our new and improved Opening Day roster featuring Ryan Zimmerman, Adam Dunn, Ian Desmond, Josh Willingham, Pudge Rodriguez and more! Let’s hope for a fantastic season this year complete with lots of wins, smiles, high fives, and backflips! See you all soon at some games and outside events coming up! 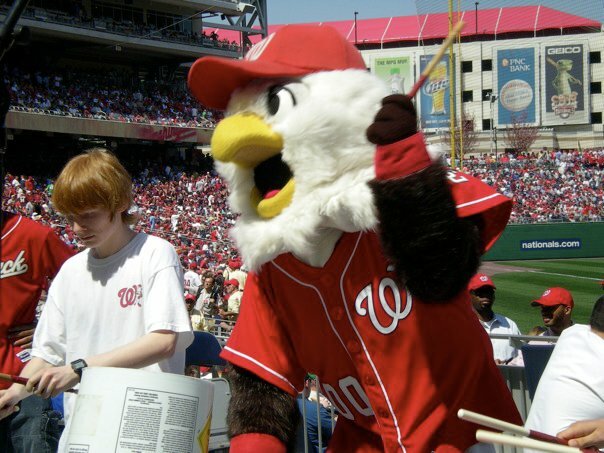 Here’s a picture from Opening Day of me playing the drums!